In 1992 the Gwich’in of the lower Mackenzie valley became the first Dene group to negotiate and settle a land claim with the Government of Canada. After the failure of the Dene/Métis Comprehensive Land Claim the Gwich’in Tribal Council (GTC) began regional land claim negotiations and an Agreement in Principle (AIP) , based on the previous Dene/Métis negotiations , was quickly reached. 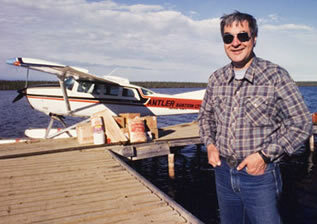 In September 1991 Gwich’in beneficiaries voted 94% in favour of accepting the terms of this AIP. This Gwich’in Comprehensive Land Claim Agreement (GCLCA) was given final approval in the House of Commons on December 22, 1992 (see map). The GCLCA covers most of the Arctic Red River watershed, a portion of the Mackenzie Delta and part of the northeast Yukon Territory. Under the Agreement, the Gwich’in were given legal title to territory more than three times the size of the Province of Prince Edward Island. They now own 16,264 square kilometres of land in the Northwest Territories (including 2,378 square kilometres of land with subsurface rights) along with 1,554 square kilometres of land in the Yukon. Over a fifteen-year period they also received financial compensation of $75 million (1990 dollars). The business investments of Gwich’in Development Corporation include companies in the construction, oil and gas exploration, real estate, hospitality and transportation sectors. Total investments topped $31.8 million in 2006. The complete Gwich’in Comprehensive Land Claim Agreement can be viewed here.